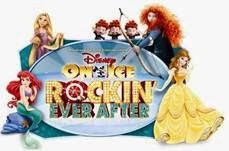 melted off! 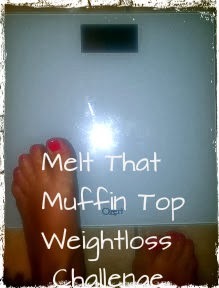 Then I hit a plateau and stopped losing anything despite all the things I tried, so I got lazy started eating somewhat normal again and luckily I did NOT gain any weight back but it bugs me after coming this far that I have not finished my journey yet, so with all that being said it's time to "melt that muffin top" and get to my goal weight! 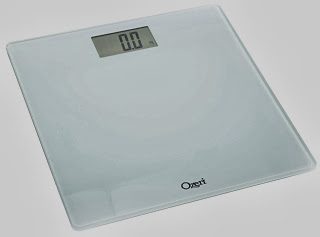 "The new Ozeri Precision Digital Bathroom Scale features auto calibration technology that makes tracking your weight easy, right out of the box. With the latest generation of Step-on Activation, your body weight is displayed immediately upon stepping onto the scale, with no tapping required to turn on or activate the scale. The Ozeri Precision Digital Bathroom Scale accurately displays results in increments of 0.2 pounds or 0.1 kilograms on its easy to read widescreen LCD, and uses 4 G sensors to capture weights up to 400 lbs or 180 kg with industry leading accuracy. The Ozeri Precision Digital Bathroom Scale also boasts a convenient unit button that instantly changes the unit of measurement from pounds to kilograms and optionally British stones. The Ozeri Precision Digital Bathroom Scale utilizes an oversized platform, impact resistant tempered glass, and durable construction. It is designed with accuracy, convenience and ease of use in mind. It also turns off automatically to conserve battery life, and runs on 1 Lithium 2032 battery (included) for the best in performance. Your Satisfaction is 100% Guaranteed." This scale is the best I've ever owned, it's sleek contemporary design not only looks wonderful, but it's so accurate and easy to use! You just step on, no annoying tapping and waiting, step on and you are ready to go, and I truly think this scale is the most accurate I've used, I have another scale in our home I can stand on it a million times in a row and get a different number each time but with ozeri it reads the same and I trust it! If you want to find out more about the Ozeri Precision Scale on Amazon HERE! I know you've probably been told not to but I found weighing myself every morning kept me accountable and motivated, even seeing 1 lb gone gave me the will power to keep going! I kept a calender and wrote in my weight everyday also had a goal weight wrote in at the end of the month! I'm not saying go buy a complete new wardrobe every 5 lbs you lose, I financially couldn't do that, I told myself if by a year I lost 75 lbs I got to spend $300 on new clothes which I went way past my goal and yes my clothes were mostly way big until my year mark but do whatever will work for you to reward yourself! I always under sold myself setting a goal, I would say "I'll lose 5lbs by a certain time then ended up losing 10lbs in that time frame, at first it was unintentional, I really just didn't have as.much faith in myself I guess by passing my goals up made me feel great, setting unrealistic goals you'll ultimately never reach in said time will only discourage you so set small obtainable goals to stay positive! I'd like to extend an invitation to you all, to join my weight loss journey andkeep each other motivated and accountable, feel free to post your goals, questions, progress and let's help each other out! I know my results are always better when I have someone to help keep me accountable! Don't forget your Ozeri precision scale and stay tuned for more post!